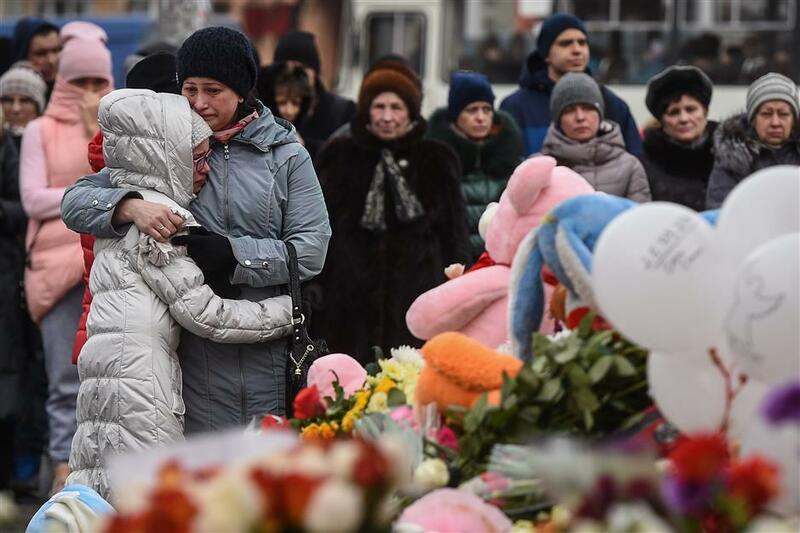 Russian President Vladimir Putin said yesterday "criminal negligence" was to blame for a Siberian mall fire that killed at least 64 people, including 41 children. People grieve at a makeshift memorial in tribute to the 64 victims of a fire in Kemerovo yesterday. Russia on Monday denounced what they called “flagrant violations” of safety norms. Russian President Vladimir Putin said yesterday “criminal negligence” was to blame for a Siberian mall fire that killed at least 64 people, including 41 children, after they found themselves trapped in the inferno because of locked doors. Two days after the tragedy and after facing criticism on social media for the delay, the Kremlin announced a nationwide day of mourning today as questions swirled about Putin’s response to one of the deadliest fires recorded in Russia over the past century. A criminal probe has been opened and five people have been arrested over the blaze, which raged through the busy shopping mall in the industrial city of Kemerovo in western Siberia on Sunday afternoon. Investigators said the victims and dozens of animals were burned alive or suffocated because emergency exits were locked, notably at one of the cinema halls where children were watching cartoons. Forty-one children were among the dead, Russian state news agency RIA Novosti reported, citing a source in the regional emergencies services. Putin visited a makeshift memorial of stuffed toys, flowers and balloons near the gutted mall’s facade yesterday, telling officials he felt “like wailing” over the number of victims.“What is happening here? These are not armed hostilities. This is not an unexpected release of methane in a mine. People, children came to relax,” Putin said after laying flowers at the memorial. “We are talking about demographics but are losing so many people. Because of what? Because of some criminal negligence, slovenliness,” Putin said. “The first feelings when they speak about the number of victims and the number of dead children... one feels like wailing — not crying,” he said. Russian newspapers ran heart-wrenching accounts of children’s last minutes as they called their parents and relatives after being separated by the quick-spreading fire. “Tell my mom that I loved her,” one woman quoted her niece as saying in comments in the Komsomolskaya Pravda newspaper. Igor Vostrikov — who lost his wife, sister and three children aged 2, 5 and 7 years — said his family had perished in one of the cinemas where the doors were locked from the outside. “No one had come to the rescue. They could have been saved,” the newspaper quoted him as saying. The head of Russia’s Investigative Committee, Alexander Bastrykin, said ticket collectors and other staff fled the scene, leaving the moviegoers locked inside. “Those workers who were supposed to be in charge of safety, organizing evacuation, they were the first to flee,” he told Putin. Temperatures during the blaze reached 600 degrees Celsius and some of the bodies were so burned they could not be identified, officials said.